The Canon EF-S 10-18mm f4.5-5.6 IS STM lens is a compact, ultra wide-angle EF-S zoom lens that lets you fit more in every shot for dramatic landscapes, sweeping cityscapes and expressive architectural images. The lens offers a minimum focusing distance of 0.22m, which allows you to get close to your subject and create eye-catching images with exaggerated perspectives. The lens' 4-stop optical Image Stabiliser (IS) uses a lens shift-type system to detect and correct camera shake and allow shooting handheld in low light situations. Canon's stepping-motor (STM) technology also delivers near-silent continuous focusing, so your movies are smooth and quiet. 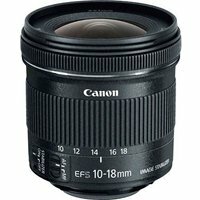 This lens is designed for use with Canon's EOS DSLRs with an APS-C sensor, such as the Canon 1200D, 70D, 100D, 7D, and 700D cameras.